Your vision for an eye-pleasing, functional room that compliments any decor will become a reality in about 2 weeks time with MidAmerica Basement Systems! Call or e-mail us today for a free basement finishing quote! 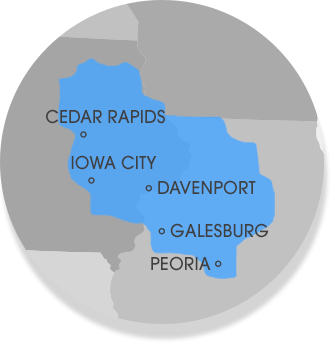 We serve the Illinois and Iowa areas, including Dubuque, Iowa City, Normal, Clinton, Moline, East Peoria, Rock Island and nearby. 2-ft. X 4-ft. panels make it possible to install floor insulation & underlayment in a single step. The only insulated subfloor system that contains no wood and can't be damaged by mold or moisture. Excellent preparation for carpeting or other finished flooring. Allows access to ducts, electrical cords, and cables.